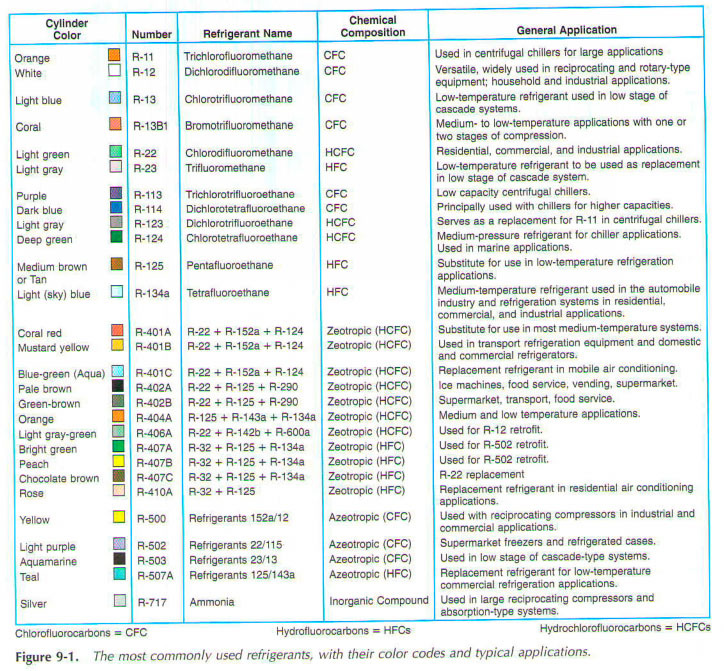 Refrigerants are identified by number. Number followed by a letter " R", which means refrigerant. This definition system has been standardized by the American Society of Heating, Refrigerating and Air-Conditioning Engineers (ASHRAE). Refer to Chapter 31 summary ASHRAE numbering system. You should familiarize yourself with the refrigerant numbers and names. Refrigerant cylinders are color-coded to allow easy identification of the substances they contain. This practice helps prevent accidental mixing of refrigerant in the system. Carefully read the label and identification before using refrigerant cylinder. The color code shown this is not a requirement for all manufacturers. Popidar refrigerants R-number and cylinder color codes are given in Figure 9-1. Tanks for recovered refrigerants grey with yellow ends.